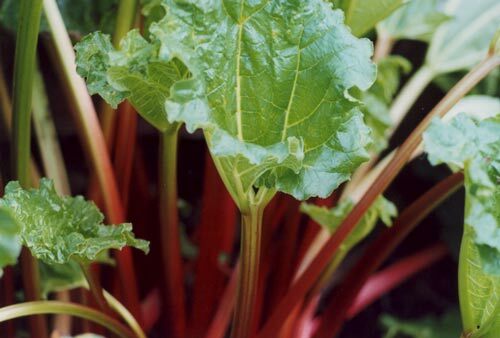 Like contributor Jim Dixon of Real Good Food, I grew up eating stewed rhubarb in the spring, and was even known to gnaw on a raw stalk once in awhile. In adulthood, chewing on the raw product has gone by the wayside, but having as much as I can is still a priority at this time of the year. Every year when I see the first rhubarb at the farmers market I'm reminded again that I didn't plant some in my own garden. The one year I did remember, I was too late; I planted the crown in the fall and never saw it again (early spring is the time…I could've looked it up). Rhubarb is my favorite pie filling, and I grew up eating bowls of it simply stewed with sugar. 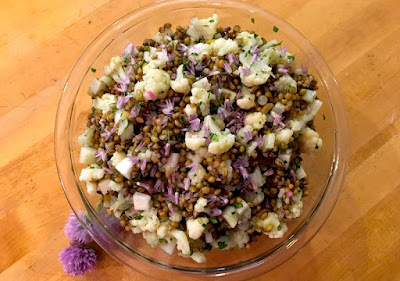 These days I mostly roast it with olive oil, usually with either honey or cane syrup. But I'm occasionally inspired to do more. After making Nigella Lawson's Venetian carrot cake and liking the unusual, not-too-sweet and very Italian dessert, I thought it would be a good vehicle for eating more rhubarb. Grate a medium-sized carrot and put the results on a paper towel to soak up some of the liquid. Cut 6 to 7 stalks of rhubarb into half inch pieces (about 2 cups or so). I mixed together a half cup each of cane syrup and extra virgin olive oil (sorry Nigella, but if you don't use extra virgin olive oil you might as well use plain vegetable oil), then added 3 eggs, a teaspoon of vanilla, a shot of bourbon, and the zest and juice from a smallish lemon. I stirred in about 2 cups of almond flour and added the grated carrot and sliced rhubarb. Parchment paper got cut into a circle to fit a 7-inch cast iron skillet (a cake pan or pie tin would be fine), and I drizzled a little more extra virgin over it to grease the pan. 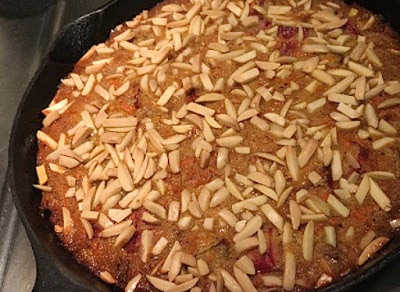 I poured in the thick batter, added a generous sprinkle of blanched, slivered almonds to the top, and baked it at 350° F for about 45 minutes. Nigella calls for a topping of mascarpone with powdered sugar and rum (or bourbon, for my version), but I like a little whipped cream with cane syrup and whiskey. Rhubarb is also awesome in other desserts, made into syrup or mixed in a cocktail…check out these other fantastic rhubarb recipes! "Looks so good and smells even better!" This could have been uttered at many moments during my marriage, and this video, courtesy my friend Holly Heyser, of her mate, Hank Shaw, a prolific author, blogger, hunter, forager and cook, is a testament to the patience (and sense of humor) it takes to live with a cook. Thanks, Holly! The first time in his life that Jimmy Serlin walked onto a kill floor was just about a year ago. 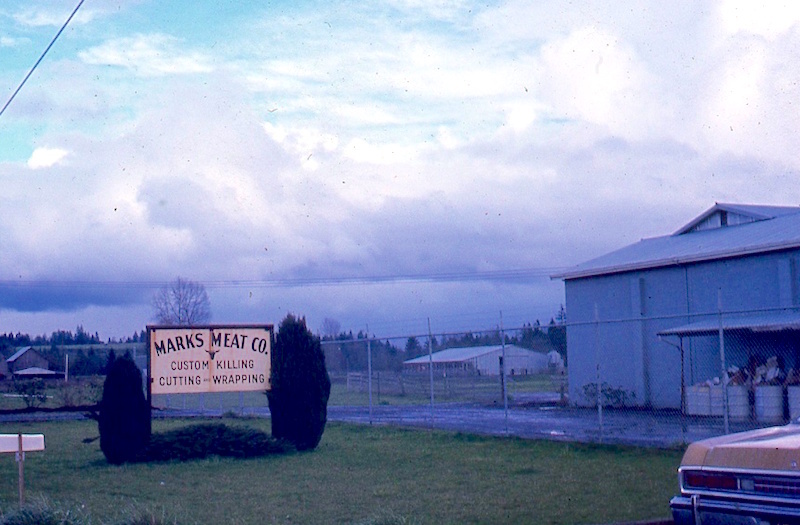 It was lamb day at Marks Meats in Canby, and 60 sheep were scheduled for slaughter and processing. Intense, smelly, dangerous work, with trolleys weighing 15 pounds hanging 20 feet over his head, it could have been disastrous. Instead, the words he used to describe it were more like those of someone falling in love. Left to right: Ben Meyer, Ryan Ramage and Jimmy Serlin of Revel Meats. It’s tempting to paint the picture as one of the prodigal son finding his calling, since his father had owned a wholesale meat packing business in Manhattan supplying area restaurants. Young Jimmy often skipped school to go to work with his dad, helping load the trucks for tips, but he found himself more drawn to the restaurants those trucks were heading to. 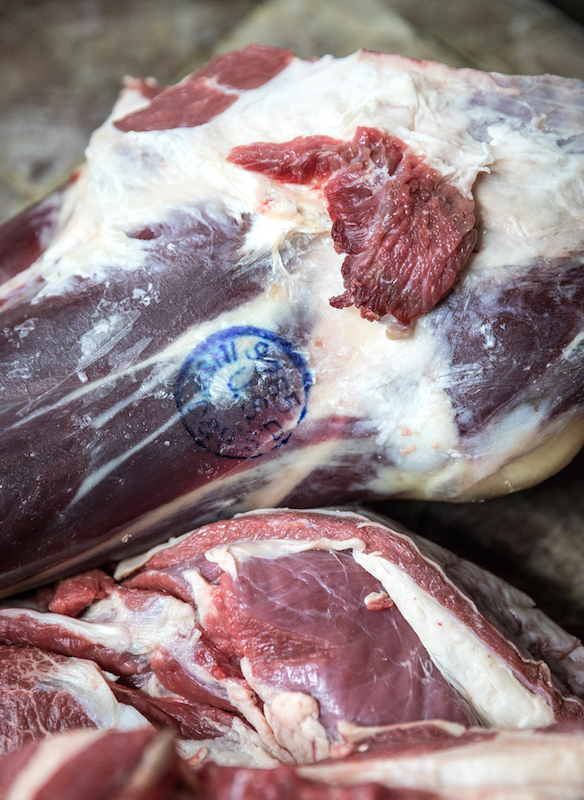 Revel Meat Co. USDA stamp. So, starting as a dishwasher at 13, he began cooking on the line soon after, eventually ending up at culinary school where he became fascinated with butchery. Stints in far-flung restaurants in New York, Vermont, Colorado and California, many with his culinary school buddy Karl Holl, cemented those nascent skills. Working for well-known restaurateur Staffan Terje at Perbacco in San Francisco, a high-rolling customer named Frank offered the pair a chance to come to Oregon and work on a start-up producing naturally raised geese for foie gras. A move to a permanent location, a farm on Milk Creek near Canby, proved to be pivotal in a way the group couldn’t have foreseen. 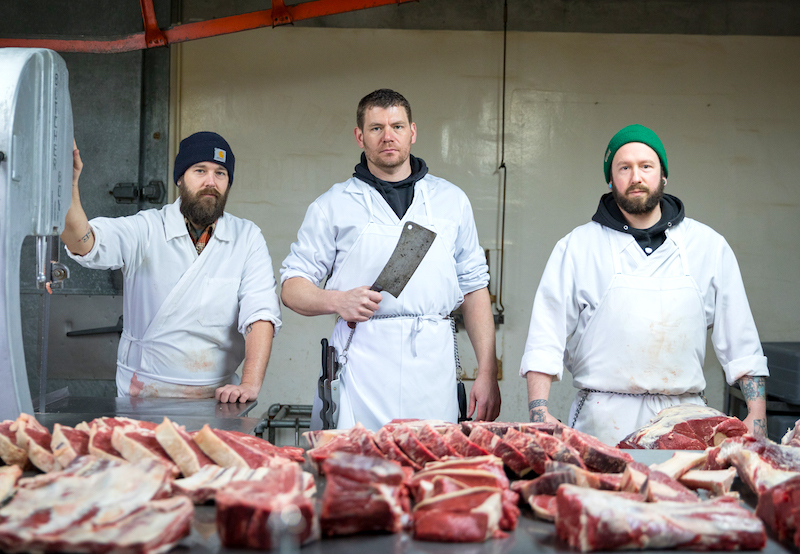 They’d often stop down the road to buy steaks at a small meat processor, where Jimmy boasted to its owner, Kris Akin, about the Let Um Eat collective. “She, of course, looked us up on the internet and said, ‘What the hell is Let Um Eat? You guys sound like weirdos,’” he said. Weirdos or not, Akin saw the value in the local network they had created, especially since she needed help finding qualified employees to process the animals into sausages and cuts of meat. And because she and her husband Joe were looking to turn the business over to new owners so they could retire. 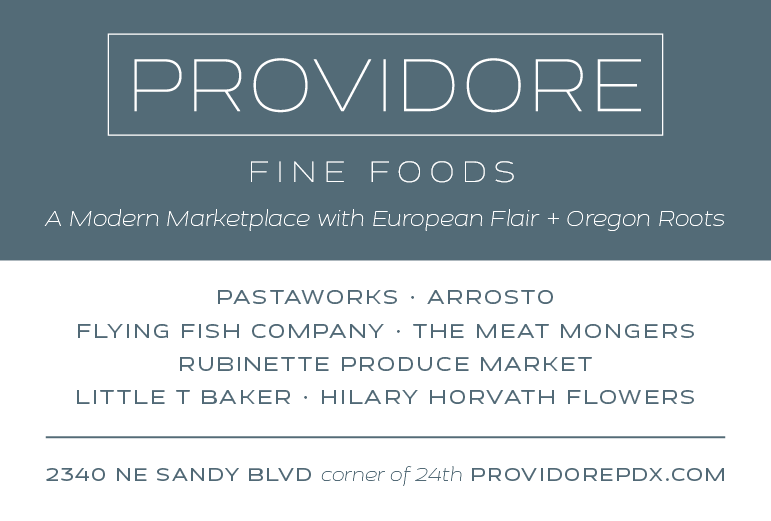 It’s probably a good point to “pivot,” as the au courant phrase has it, to discuss some of the history of meat processing in Oregon. 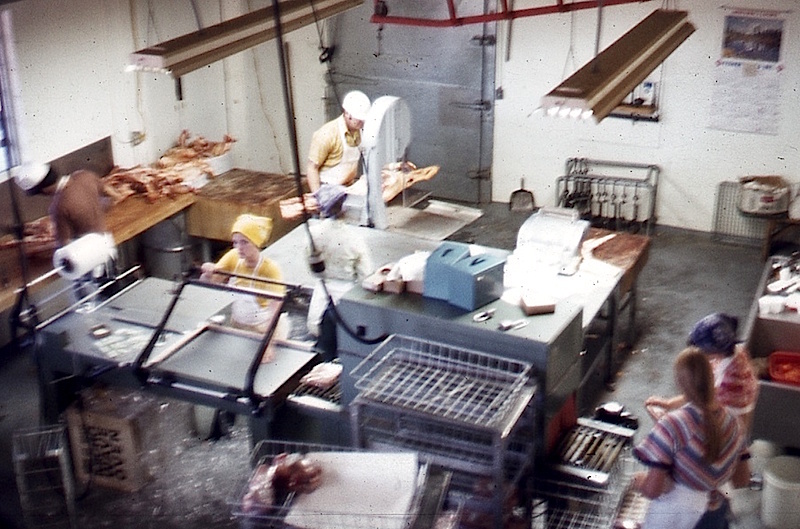 According to Akin, in the mid-20th Century there were more than 1,000 small meat processors operating in Oregon, with one in almost every small town. 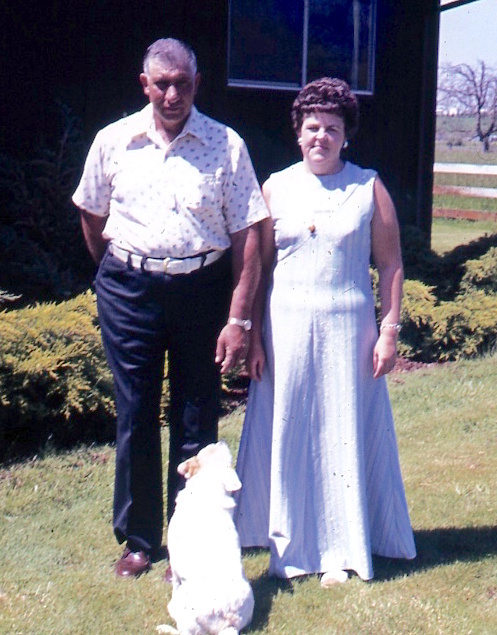 They served as slaughterhouses and processing plants for local farmers and ranchers, and most were regulated by the Oregon Department of Agriculture’s (ODA) meat inspection program established in 1957. 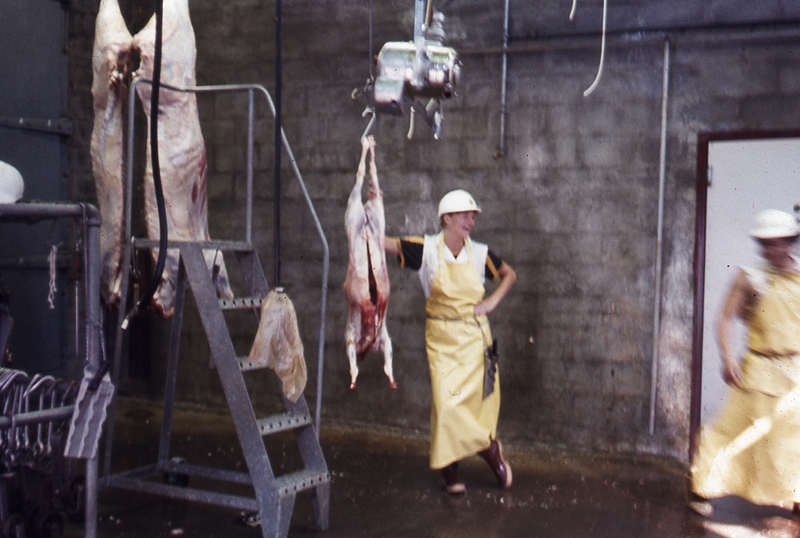 By 1967 the Wholesome Meat Act passed by Congress gave the USDA the responsibility of ensuring that animals were slaughtered humanely and that states maintained meat and poultry inspection programs at least equal to the federal program. At that point Oregon turned over its meat inspection program to the USDA, which meant that small processors had to upgrade to meet federal standards—an extremely expensive proposition for marginally profitable businesses—or become “custom exempt,” meaning that they could only slaughter and process livestock for the exclusive use of the farmer and agree to inspection by both ODA and USDA once or twice a year. 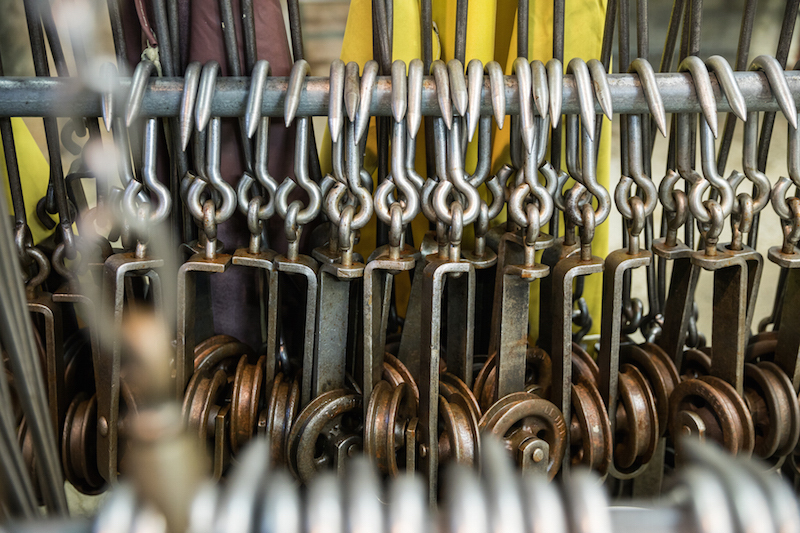 Without access to funds to invest in updating equipment, hire skilled workers or do the marketing to find producers, not to mention consumers to buy their products, small facilities suffered. The implementation in 1996 of the Hazard Analysis and Critical Control Point (HACCP) system—establishing new requirements to improve food safety—and the simultaneous consolidation in the grocery industry were an “inflection point,” according to Lauren Gwin of Oregon State University’s Niche Meat Processor Assistance Network. This shift from small grocers to large supermarkets, which closed butcher departments and switched to boxes of pre-cut meat from large processors, caused many of the state’s small slaughterhouses to shutter. 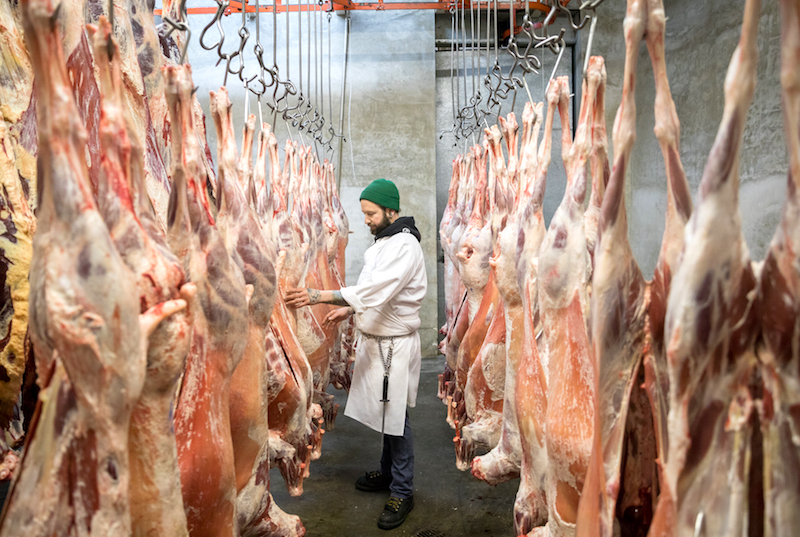 From 2000 to 2015, mobile and custom-exempt facilities in Oregon dropped more than 30 percent, from 93 to 63, and the number of USDA-inspected slaughterhouses fell 25 percent, from 16 to 12. 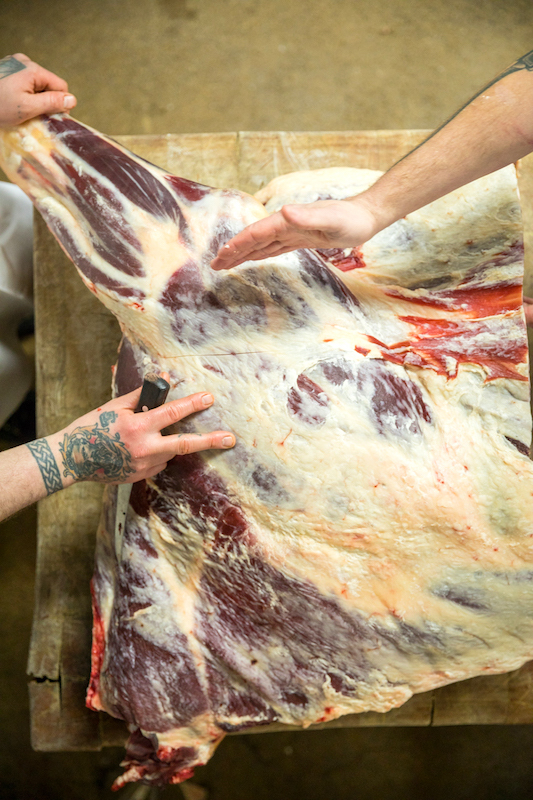 Because pasture-raised and grass-fed meat from small farms is in increasingly high demand from consumers who want to know where their food comes from, including how it was raised, slaughtered and processed, it’s critical to the health and vibrancy of Oregon’s food system that small processors survive to serve them. 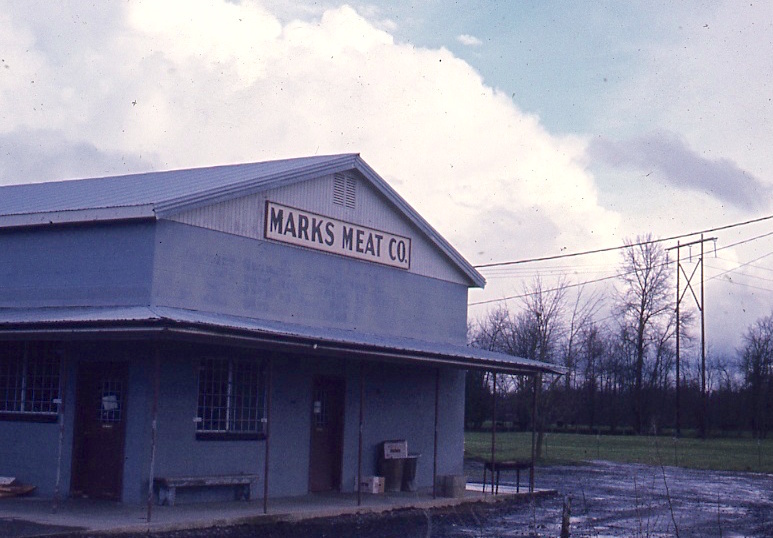 Read the next post in the series, an interview with Kris Akin, owner of Mark’s Meats, about the challenges of passing on a family business. The third post focus on the future of small processors in an interview with Ben Meyer, titled Upending the Status Quo. All photos by Rich Crowder. 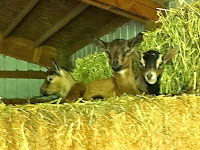 It's always good for me to stop staring at the computer and head out into the real world, and for me the best place to go is to a farm, especially if it's that time of year when lambs and pigs and goats are popping out babies right and left. Michael and Linda Guebert of Terra Farma had been posting some adorable pictures of their latest litter of piglets on Instagram, and since I'd been talking with Mike about arranging a visit when the winter rains abated and their pastures dried out, I asked if they might have some time for a viewing. 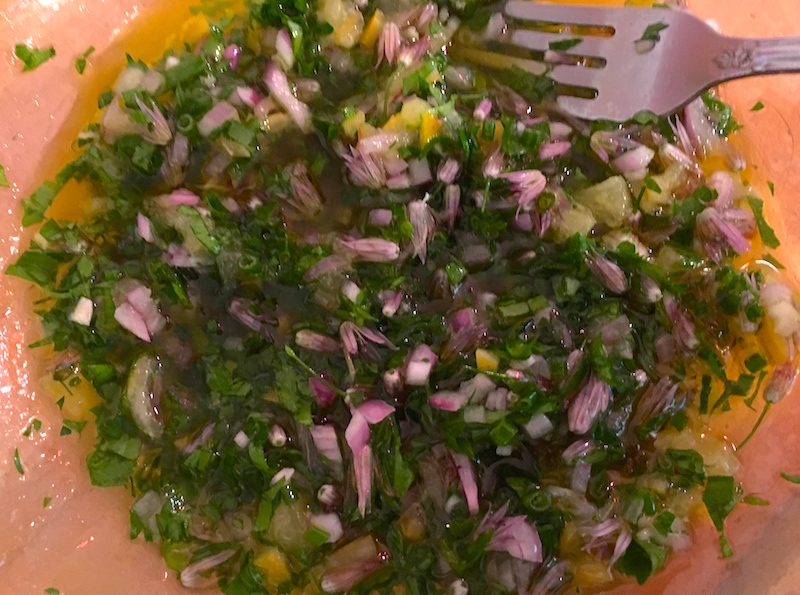 Yesterday was the appointed day for that long-awaited visit, and with the morning promising (mostly) blue skies and reasonable temperatures—woohoo!—I jumped in Chili and drove out to the farm. Even if you don't have a farm to visit, I can testify that the drive to Corbett via the Old Columbia River Highway is spectacular this time of year, lushly green from all the rains and with the Sandy River running thick with runoff from the many streams that feed into it. 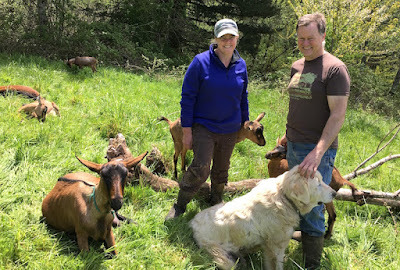 Primarily a livestock-based operation, Linda and Mike raise pigs, chickens, turkeys, guinea fowl and rabbits for meat, and milk three cows and several goats twice a day. They also have laying hens, and sell raw milk and eggs out of a refrigerator on their porch to a regular clientele who come to the farm. Located on 10 acres of hilly terrain above Smith Creek, the couple run the farm on a rotational grazing system, moving the groups of animals to fresh pasture in a series of paddocks so that the health of the pastures is maintained and, hopefully, improved. 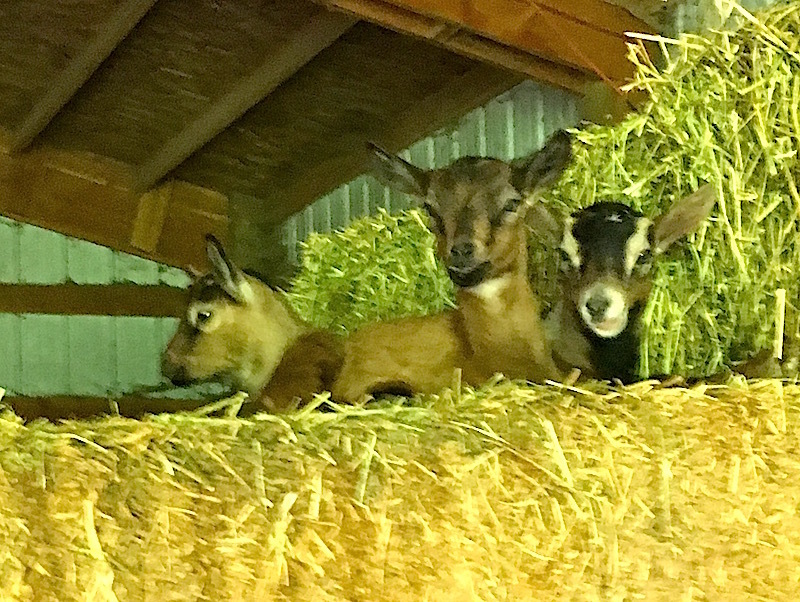 Also in the barn was a set of several-week-old goat triplets staring down at us from their perch on bales of hay about eight feet off the ground. 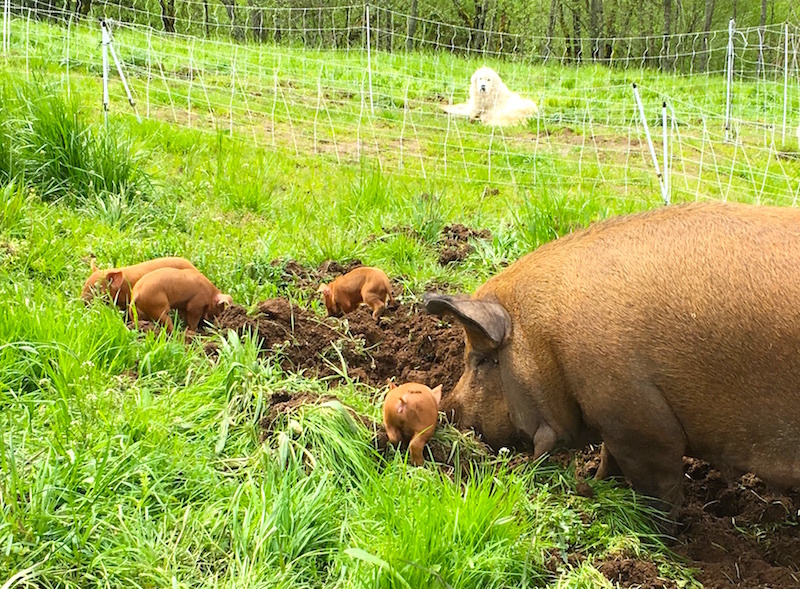 After a meet-and-greet, we went out to meet the new piglets and their mama, a sow named Cinnamon, who was busy showing them how to properly root in the grass. 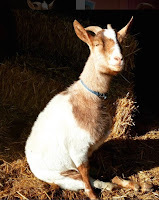 The wonderful part about visiting farms and talking with farmers who care about their animals the way that Mike and Linda do, is seeing them pointing out the individual characteristics of each animal, laughing at their behaviors, telling stories and being genuinely engaged with them. It's heartening in a time when agriculture seems to be turning more and more toward an industrial model, when a living being—the animals and often the humans who work there—seem to be treated as no more important than a widget. 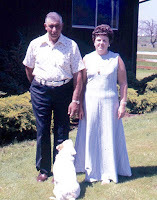 Thanks, Mike and Linda, for caring and for sharing your farm with me!